What are the tires you went with? I just picked up a 76 Cb360 and I am wanting to go with the dual sport style build as well. Any updates on the build? I'm interested to see what it looks like. I'll check tonight and see what tires they are. They were off brand of some sort because they were the only size I could find that fit the bill. I don't have a lot of progress as of right now. I'm a glutton for punishment, so I started up a small company this spring, in addition to my real job, so time has been hard to get. It's also summer and I've done about 10,000 miles worth of touring trips, my shop flooded with the torrential rains we got in June, so yea. This winter though I'll get after it. (I said that last winter). Good news is I got my carbs back from CrazyPJ, and they look awesome. FYI they are Golden Boy tires. I believe made by shinko. Update time. The engine is back in the bike! Thats progress. I went through the factory wiring harness and it is all there, and I couldn't find any spots where it had been chewed on by a mouse or anything, and it was never hacked or cut either. I'm in process of finishing cleaning it up as it had quite a bit of dirt build up on it. I just dropped the last batch of parts off to be powder coated. This includes the rear brake stay, kick start lever, kick stand, shift peg, and rear brake lever and some other misc parts. Should have them back later this week or early next week. I ordered new hand controls, and a new regulator/rectifier. I'm going to do coils as well. Are the ones from Common Motor or Spark Moto the best way to go or are XS650 coils a plug and play option? Lastly, does anyone know of a good headlight to use? I want a black bucket with a black mesh screen over the lens. I can't seem to find anything I like. 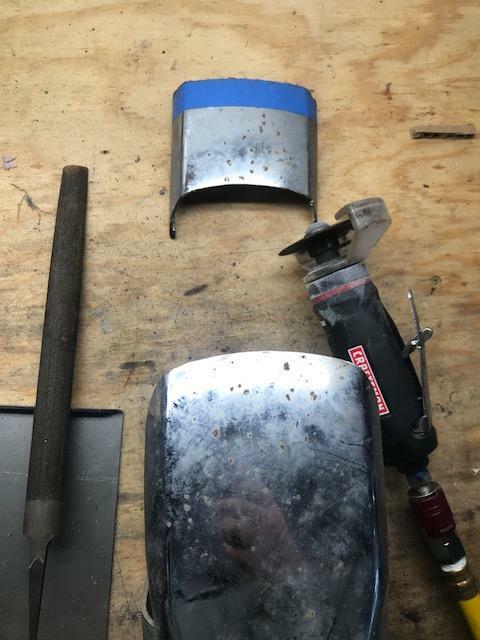 XS650 coils will work, but require a new bracket to be fabricated. The Sparck Moto ones and Common Motor ones are plug and play. Reminds me of a Triumph that my buddy found literally buried to the handlebars in pig poo. Dug it out, took it to his dad's barn, and I helped him with it some while on leave from the Navy. Made a pretty good bike for him until he "upgraded" to a Harley chopper. If you get the chance, look up some of Dale Walksler's "What's in the Barn?" Making progress. Got the front fender cut down to where I want it and it will be going blasted and powdered this week. 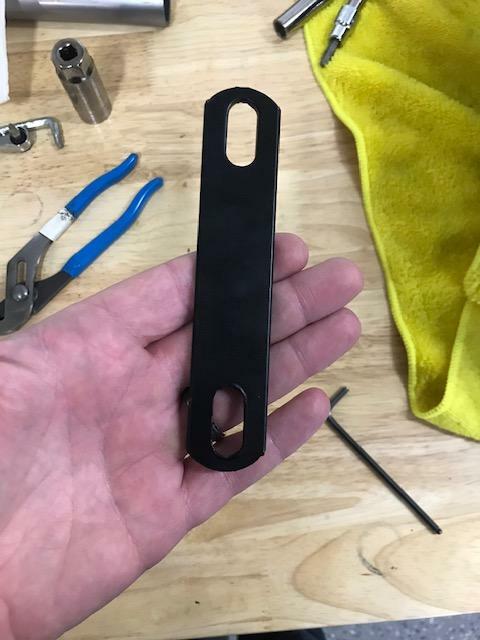 Started mock-up on a battery tray, but I need to go find a battery for this thing so I can make sure I get my dimensions where I want them and lastly the wiring harness is mostly cleaned up and should be serviceable. I ordered a headlight from ebay, it was a cheap Chinese one, and the mounting bolts on either side were not even. So I still need to get that sent back. 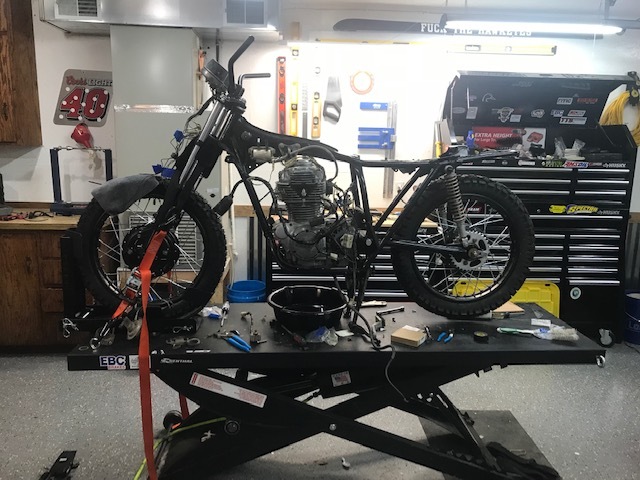 I am waiting on the hand controls and regulator/rectifier I ordered from Sparck Moto a couple weeks ago, and then I need to order new speedo/tach, seat, chain, rear shocks, and figure out what I want to do with the rear fender. 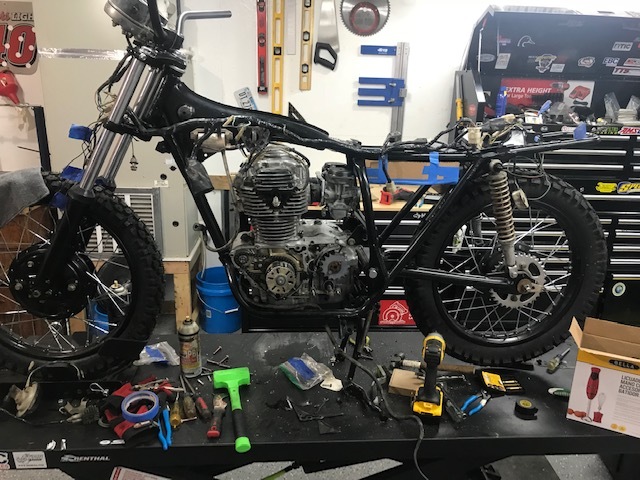 This bike will get ridden on gravel and probably some dirt roads and stuff, so I do need a fender that will protect the carbs/engine from debris. Anyone have any ideas? Just got your email and I responded. Looking into the issue right now. Got my box of misc parts back from powder coating. 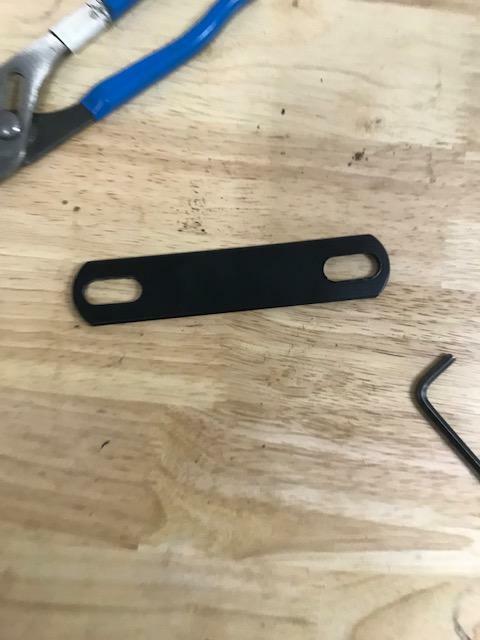 Does anyone know what this bracket is for? I can't for the life of me figure out what it was.